The Moscow Kremlin is one of the world’s most iconic buildings. It is the largest fortress in Russia, as well as one of the largest fortresses in Europe. The first ever structure of the Kremlin was wooden, then it was made of stone and after that it had a brick structure. It was built on the orders of Prince Yuri Dolgoruky who was also the founder of Moscow. It also served as the residence of the feudal princes of Moscow. Currently it’s the official residence of the President of Russia. In 1990 the Moscow Kremlin together with the Red Square was elected as a UNESCO World Heritage Site. The Kremlin is home to five palaces and four cathedrals which makes it the largest active fortress in Europe. It also hosts the world’s largest bell, the Tsar Bell. It has never rung because it was broken during the construction. This bell stands on a pedestal next to the Ivan the Great Bell Tower which is 20.1 feet tall. The Kremlin is in the form of a triangle and is surrounded by massive walls and towers. The triangle of the Kremlin wall encloses an area of 275,000 square meters. Its overall length is 2,235 meters. Initially there were eighteen Kremlin towers but two additional towers were added in the 17th century. The height of these towers is up to 80 meters. The largest square of the Kremlin is Ivanovskaya Square. Declan, Tobin. " 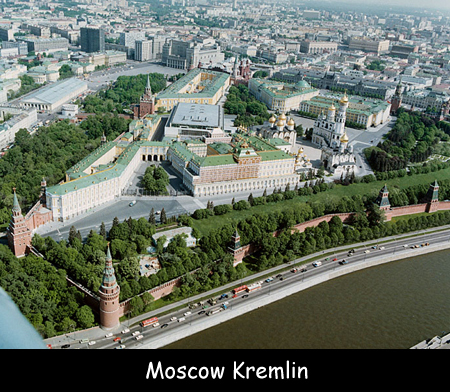 All Moscow Kremlin Facts for Kids ." Easy Science for Kids, Apr 2019. Web. 25 Apr 2019. < https://easyscienceforkids.com/moscow-kremlin/ >.